We are in the very last preparations for Christmas. The secularists have been preparing for this "holiday" for a couple of months now. They see it in terms of dollars and cents. That's why the Christmas season is over for them in a few days. For us who commemorated the real reason for Christmas, the season will begin with the holy Mass of Midnight on Christmas Eve. There was a time when the Christmas tree was decorated after dinner on Christmas Eve? Then, it was not taken down before January 6 which, at that time, was the Feast of the Epiphany (Three Kings). This is the spirit of Christmas; we celebrate the birth of Jesus Christ, the Son of God in our midst. Hence, we have the twelve days of Christmas. Hopefully, we don't want to celebrate Christmas as if it were about money, presents and parties. It's about Christ. Because of Him, we have potential for true love, true peace and true joy. This is something for which to be happy. The best way to celebrate is to pray the perfect prayer which is the holy Sacrifice of the Mass. Then, we can continue this by going to Mass each day of the Christmas season. In our current liturgical calendar, this season lasts from Christmas day until the Feast of the Baptism of the Lord which this time (2014) is on Sunday January 12. So, instead of twelve days, we will have nineteen days of prayerful celebration. May each of us at this time be fully open to Jesus. Let Him come into your heart. Know his Love. 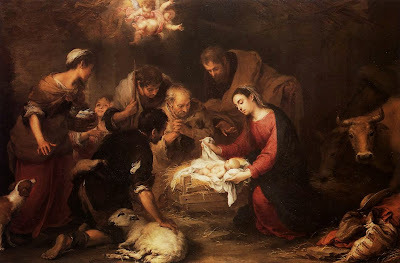 I wish you a most happy Christmas, filled with the Love of Christ, our Lord.